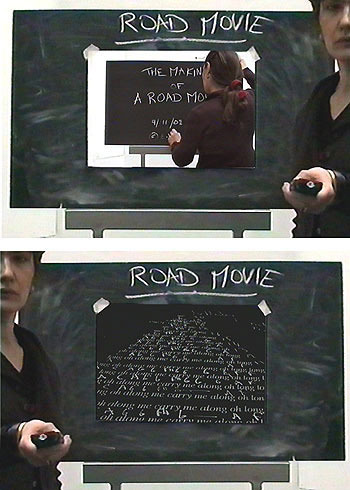 The artist makes her own road movie. A live video relay allows the audience to witness simultaneously the process as well as the finished thing – a hypnotic time-based melody with built-in suspense. This performance concludes the idea of a roadwork I have been developing since 1996 — a journey paradoxically spent endlessly carrying the “baggage” of the road of life that we wander. The idea of fluidity and flux in identity and space has been central to modernity and has, overtly or covertly, found its way into my multidisciplinary art practice. Emmanuelle Waeckerle is a senior lecturer in visual art at Surrey institute of Art and Design in Farnham. Project developed with financial support from London Arts. Travel to Toronto funded by Surrey Institute of Art and Design.